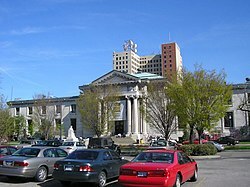 The Louisville Free Public Library (LFPL) is the largest public library system in the U.S. state of Kentucky. Officially opened in 1905, the library's main branch is sited at Fourth and York streets, south of Broadway in downtown Louisville. The library's Head of Reference from its opening until 1910 was Marilla Waite Freeman, who would go on to become one of the most well-known librarians in the country. Additional branches were added over time, including the Western Colored Branch, which was the first Carnegie-housed library in the U.S. built solely for African Americans. Thomas Fountain Blue was appointed head of the Colored Branch in 1905 as well as the Eastern Colored Branch when it opened in 1914; he also started the first library training program for African Americans in the United States. During the flood of 1937 the museum, which was located in the basement, was forced to move to the Monserrat school. In 1950 the library became the first library in the nation to put its own FM-radio station on the air—WFPL. A second station, WFPK, joined it a few years later. In 1969, a $4 million north building was added to the classicizing Carnegie structure. This provided an additional 110,000 square feet (10,000 m2) of floor space, compared to the 42,000 sq ft (3,900 m²) in the original building. At one time LFPL had over 30 branches, but a number of them were forced to close due to lack of funding. Currently, there are 17 branches, in addition to the main library site. Internet services and inter-library loan have helped to make up for havig fewer branches. In 2007, a proposed tax increase to pay for Louisville Free Public Library improvements and ongoing costs was soundly defeated in spite of strong support by many political and business leaders. Nonetheless, with the help of the Library Foundation and community support, a new education and technology-driven, $1.9 million branch library was completed and opened in the Newburg area (a traditionally underserved community) in August 2009. In early August 2009 the main branch was flooded when a storm dropped 7 inches (18 cm) of water on the city in 75 minutes. The library servers, bookmobiles, offices, and processing rooms were under 6 feet (180 cm) of water. 50,000 books were destroyed, and the building severely damaged, with a total estimate of $5 million. Structural, mechanical, electrical, and computer systems damage were near complete, forcing the main library to close for several weeks. Other branches in the system in hard-hit areas were closed for a few days while damage was assessed and cleanup undertaken. The library system itself remained open for business throughout the event. The last time the main building had flooded was in the Ohio River flood of 1937. Three other branches of the library system were damaged or affected in the flooding as well: Bon Air Regional Branch, Iroquois Branch, and Shawnee Branch libraries. Despite the level of damage, library services at all branches, including the main, were able to return to near full service. The August 2009 flooding dumped 3 feet (1 m) of water into the basement of the Louisville Free Public Library's Main Library. The damages to the facility and its holdings amounted to nearly $8 million. Library management decided that rather than simply repair the damage, they would move ahead with plans to renovate and improve the Main Library with millions of dollars in capital improvements, especially its South Building, which fronts on York Street. By the end of 2010, the library expected to have spent about $12 million on renovations and improvements. ^ a b Louisville Free Public Library Board of Trustees. Annual Report of the Board of Trustees of the Louisville Free Public Library (1905-1911). Louisville, Kentucky. Retrieved 20 November 2017. ^ Burress, Jacob Carlton (2016). The colored librarian: Thomas F. Blue and the Louisville Free Public Library's Colored Department, 1905–1935 (MA). Louisville, Kentucky: University of Louisville. p. 3. doi:10.18297/etd/2420.